Home | Leadership Behavior DNA | Article – What’s Your Natural Behavior When Fear and Doubt Strike? You’re in the midst of a situation or challenge that instills fear. What do you do? In the animal kingdom, fear produces a “fight or flight” response, and it’s true with people, too. But honorable leaders see fear coming and know how to handle it, right? Regardless of your natural behavior, the biggest challenge for many of us is going to be our doubts and fears. Let’s explore this idea. I use both terms because some people aren’t able to acknowledge their fears, but they will admit to having doubts. For most situations, I treat them equally because they’re often the same and both can undermine success. Beyond the obvious, fear is often at the root of emotions like anger, shame, guilt, and pride (false pride or hubris). Doubts and fears can also cause procrastination and resistance to reasonable and needed risk-taking, and stymie initiative to overcome obstacles and achieve success. How have other people managed fear in the past? I witnessed it firsthand. Also, be aware of your natural behavior—are you more trusting or less trusting? Are you more skeptical or less skeptical? 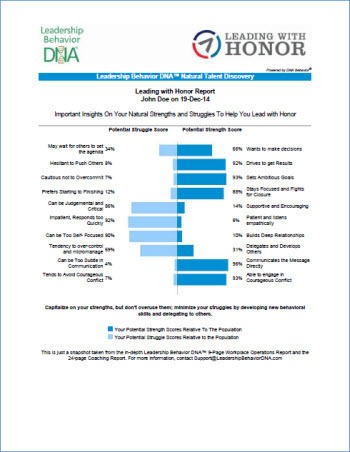 We use our Leadership Behavior DNA assessment to help leaders pinpoint their natural strengths and struggles in these areas so that they better manage them. Fear is Normal—Learn to Proactively Manage It. Fear can help us deal with legitimate external threats as well as trigger adrenalin and other chemicals that help us. We can train and equip ourselves to make logical choices that manage our fears (instead of our fears managing us). More recently, in the last twenty years my fear of failure was one of several motivators that helped me author five published books. Oppositely, fear of failure not managed can cause all sorts of problems as mentioned above. When Fear Hits, Stick With Your Values and Principles. Even when we’re overwhelmed, we still have choices about how we’ll respond. Once a leader clarifies what is really important, he or she can make courageous choices to achieve goals even when faced with doubts and fears. The lesson I learned (and can see it operating in all successful people) is that we must be willing to suffer to be who we are called to be and to achieve our most important goals. Need a set of values? 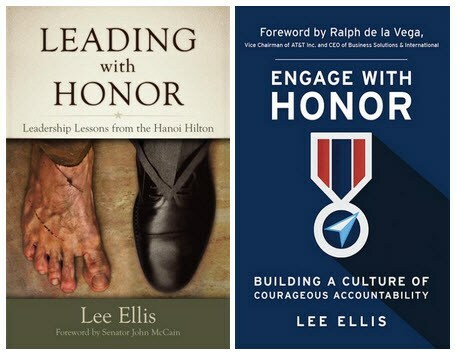 Download the free Honor Code. Be Willing to Suffer for the Right Causes. Great achievements are generally the culmination of a lot of delayed gratification, making hard choices and doing hard things—and yes, suffering. So when you look ahead at your goals, consider your passion for them. Is your passion and commitment strong enough that you’re willing to suffer to achieve them? If so, then you’ll be able to lean into your doubts and fears to do what is needed. But to ultimately get results and achieve our goals, we must also balance and value the importance of strong relationships. This point leads to the last tactic. We need connection to others who can support us with wisdom and encouragement. Engage with your key support team to help you courageously lean into the pain of your doubts and fears. As a leader, you also have the power to create this culture of support. What’s Your Natural Strengths and Struggles When Fear Strikes? The unique, psycho-metrically validated Leadership Behavior DNA® (LBDNA) assessment process can pinpoint your exact level of your “go-to behaviors” during fearful situations. Thousands of people every year rely on LBDNA to help them and their teams grow both personally and professionally.